This ESL lesson plan teaches beginners how to give basic instructions in English. It includes; a lead-in activity, along with some practical ESL classroom activity and game ideas that accommodate low-resource classrooms. If you use an iOS or Android device, don't forget that you can get offline access to these materials, along with a much more extensive selection of ESL lesson plans, through the TEFL Handbook app. Our suggested board work uses colour-coded text to give English teachers an idea of how the interaction might play out in the classroom. In this case, elicit as many commands as possible using mime. As always, the use of L1 is optional. Students have to respond to instructions with the correct action. Start by teaching the students the correct action for all of the commands on the board. Act out each one and have the students copy you. Depending on the level of the class, you can speed this up or change the order unexpectedly. Do this for as long as you feel is necessary. With books closed, students will have to remember the correct action for each command. Before you begin, erase the examples from the board and ask the students to close their books. 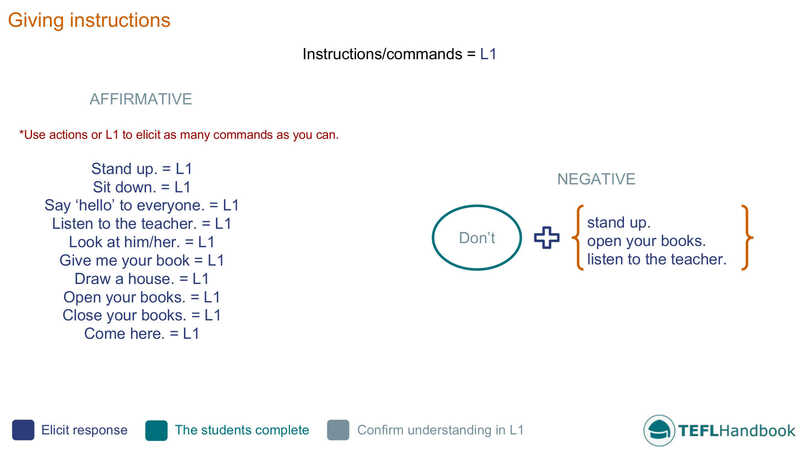 Give the class commands from the list in a random order, adding negative forms into the mix as you go. A fun role-play activity where students pair up to give each other instructions. Start by dividing the class into pairs and spreading them out around the room so that they all have enough space. Next, tell the students that they will take turns giving their partner instructions. Their partner should respond with the correct action. Encourage them to correct mistakes and use negative forms. Allow students a minute or two in each role. As usual, our suggestions for ESL games require the minimum of resources (whiteboard, markers, dice). Players have to be fast on the trigger to survive this team elimination game. Start by dividing the class into two teams. For every round, have one student from each side come to the front of the room. They should stand about a metre apart, facing each other, waiting for your command. When you give them an instruction, they have to respond as quickly as possible. The slowest player to act is eliminated from the game. 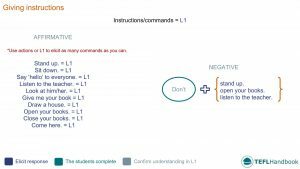 If you're feeling nasty, you can make it more difficult by tricking the students with negatives, eliminating players who act on a negative command. We can adapt this classic elimination game to revise giving instructions. Have the students spread out evenly throughout the classroom and place yourself at the front of the room facing them. You will then start to give out instructions based on the target language of the lesson. If you say the words "Simon says" before the command, the players must copy the action. If you don't say those words and they perform the instruction, they are eliminated from the game. You can make it more difficult by adding negatives and eliminating students who perform an incorrect action. If you're looking for more ESL activities to teach commands or the imperative, this article from busyteacher has some excellent ideas for adult classes. If it's free worksheets you need, islcollective have a fabulous selection. They also have a board game that practises imperatives. Kids Online English have a fantastic video which complements this lesson and serve as a helpful little revision activity. Check it out below. If you've found these ideas useful, have a look our complete list of ESL lesson plans for beginners (A1 Upper), as well as our entire collection of ESL lesson plans. Our suggested next lesson is on questions with "have got".